Being simply a bicycle with an engine attached, the cyclemotor was the first motorcycle and one of the very first designs of motorized transport. Bicycles were invented early in the 19th century, but were cumbersome and dangerous beasts with large wooden wheels and pedals at the front. Toward the end of the 1800’s, however, the revolutionary ‘Safety Bicycle’ was invented. This is essentially bicycle design as we know it today. With the introduction of pneumatic tyres soon after, bicycles now became practical enough for ordinary people to use. The early years of the 20th Century saw engines fixed to bicycles to become the first motorcycles. Engines were likewise added to tricycles to become the first cars. At the beginning, of course, these motorized bicycles, tricycles and four-wheelers were very basic and, often, dangerous. Roads were more suited to horses and carriages, and pedestrians were not used to motorized transport. There was much public consternation about petrol-driven vehicles, and some considered them the devil’s transport. Note that hearses remained ‘coach-built,’ ie having the appearance of horse-drawn vehicles, for many decades into the 20th century. Edward Butler’s ‘Petrol Cycle’ (below) was a case in point. Introduced in 1887, it had a 4-stroke engine with surprisingly advanced features such as chain driven rotary valves, electrical ignition and a float feed carburettor. Unfortunately, the 4mph maximum speed limit precluded its proper use. The Police would not let Butler use it, and it was broken up for scrap. There is always resistance to forward-thinkers who are ahead of their time. 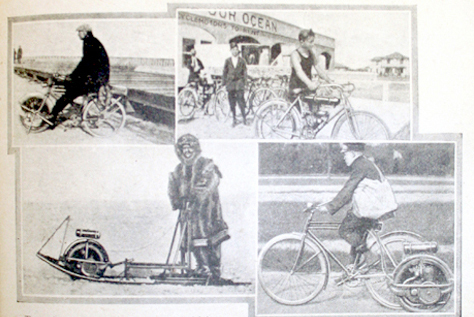 By the 1910’s, bicycles had liberated ordinary people. They could now travel much more freely. This was also a major boost for female emancipation. Motorcycles were still very basic, but the demands of war from 1914 accelerated the design and functionality of all motorized vehicles. By the end of the War, the first generation of vehicle had been superseded. Just as the bicycle had suddenly become ‘usable’ 20 years before, motorcycles and cars built after WW1 were now practical enough for use by ordinary folk. This was the beginning of motoring society as we now know it, a hundred years or so later. But as motorcycles developed into powerful heavyweight machines, there was also a market for lightweight motorcycles and cyclemotors. With the exception of the Wall Autowheel, early cyclemotors were not manufactured in great quantities, and these days you don’t see so many of them around, even at vintage events. But, with typically British preference for the ‘underdog,’ cyclemotors are becoming increasingly popular. If you take a cyclemotor to a show, people are likely to walk right past the most exclusive upmarket vehicles to see your little bicycle-with-engine-attached. The 1910’s were a time of great innovation and I love discovering the inventions of that time. I only have a few vehicles of that era, as they’re rare and expensive (though I have owned, restored, and sold various early models and I’ve included their details here). Most of my cyclemotors are now post-WW2. But – and this is no doubt one of their major attrctions – because cyclemotor design changed little in 50 years, the experience of riding a postwar cyclemotor is very much like riding one of the earliest pioneer motorcycles. You can find a complete history of post-WW2 cyclemotors in the Online Cyclemaster Museum website. Here, we look at their earliest evolution and acknowledge their rightful place in the history of motorized transport.